Home » » Why De-Growth? We now hear talk of “decoupling” economic growth from material and energy throughput, which would be desirable, but we must be realistic because we possess very few actual examples of such decoupling. Historically, economic growth leads to increased energy and materials throughput. For example, some people once claimed that computers would “save paper” but this did not happen. Human society today uses six-times more paper than we did in 1960. Computers accelerated economic growth, and although this yielded benefits to certain sectors of society, the growth required more consumption, ecological devastation, and social inequity. Yes. But to achieve ecological balance and social justice, we need to respect the limits nature places on material and energy throughput. A social transition can take place without total system growth, but even solar panels and windmills require materials and energy, rare-earth metals, copper, steel, silicon and so forth. We don’t mine copper or silicon with solar energy, we mine them with hydrocarbons. Furthermore, energy systems – windmills, solar arrays, dams – have fixed life-spans, so even if we built enough renewable energy to power a world of 9 billion people, that infrastructure would have to be built again, and again, forever, to be “sustainable.” In nature, desire does not equal capacity. We have to start with Earth’s capacity and design our cultural transition based on that capacity. Therefore, the key policy of any ecological energy plan must be conservation, the only solution that does not require material growth. Conservation has to start with wealthy nations. If rich consumers reduced energy consumption by half – possible since rich economies waste so much energy – then the rest of the world could double energy use, and we could still reduce total world energy use. But if we attempt to power the wasteful, consumer culture built on fossil fuel for 9-billion people, we encounter some inconvenient laws of physics, thermodynamics, and ecology. Yes, but we will need to question our assumptions. Historically, humans have made millions of industrial efficiency gains without reducing consumption. When society achieves efficiency with a resource, it becomes cheaper, so we tend to use more, not less. This phenomenon, documented by William Jevons during the coal era, is known in economics as the rebound effect. Efficiency could reduce consumption, but humanity has a poor track record of doing so. Historically, efficiency gains increased profits or reduced consumer costs, but do not save resources. We can change this but we should not be naive. Yes, growth is not innately evil. However, growth is not innately “good,” and can become destructive even in nature. When our cells don’t stop growing, we have cancer; if our bodies don’t stop growing, that is obesity. Successful species grow until they overshoot their habitat capacity. Growth can become a liability. The word “growth” does not mean the same thing in different contexts. Non-material qualities – species diversity, innovation, or human ideas – can “grow,” but this is quite different from the growth of material things such as populations, cell phones, or power plants. Even non-physical qualities – beauty, love – require physical foundations with limits. Nature can produce five species of finches or fifty species but nature imposes limits on the total biomass of finches, or forests, humans, or human technical artefacts. Forests reach a limit that we call “maturity,” at which point the forest reaches dynamic homeostasis, roughly stable biomass with shifting diversity. Humans can create virtually unlimited musical styles, but only a limited number of maple cellos with ebony fingerboards. A biophysical supply chain makes “non-material” social innovation possible. Dreaming up innovations may require near-zero material throughput, but the practical application of those innovations requires energy and materials. Nature’s growth rates remain tiny compared to human economies. Nations typically attempt to grow their economies at 3-4-percent annually. Since about 1750, this equates to a doubling of human consumption every 20 years. On the other hand, over the last 500-million years, Earth’s biomass has doubled about every 50 million years, 2-million-times slower than human economic and consumption growth. Growth is natural, but not anywhere near the rate that bankers and neoclassical economists want economies to grow. Secondly, collapse appears frequently in the fossil record and in human history. Biological diversity reached capacity limits not only during the famous “five extinctions” but in thousands of minor extinctions. About 600-million-years-ago (mya), free oxygen allowed cells to extract more energy from the ecosystem, unleashing tremendous diversity growth. However, this growth reached habitat limits many times between 550mya and 200mya, as species diversity crashed, recovered, and crashed again. Growth does stop in nature, and reverses. The rate of diversity growth peaked during the Cambrian era, 550-500mya, and has not been equalled since. Diversity is not a one-way progression; it grows, stutters, collapses, and recovers based on environmental capacity and conditions. Today, human sprawl reduces Earth’s biological diversity. Humans occupy and impact habitats, replacing and obliterating species. If natural growth was unlimited, then these other species could survive human expansion, but human expansion fills and depletes ecosystems, exposing nature’s limits. Likewise, we witness cultural diversity growth and simultaneous cultural loss. Industrial growth has diminished cultural diversity as well as species diversity. Historical anthropologist Joseph Tainter has shown that when societies grow, they inevitably face problems related to habitat capacity. To solve these problems, they develop new technologies, but these solutions tend to create new problems (irrigation causes salinization, nuclear energy causes leukemia, and so forth.) Highly complex societies eventually experience “diminishing returns” on their innovations, which Tainter explains in The Collapse of Complex Societies. A few societies overcame this dilemma by simplifying their systems, but most overshot their habitat and collapsed. Growth is not a solution for societies in overshoot. Rather, solutions to overshoot involve reduced consumption, simplification, and a return to fundamental rules of ecology. Human social complexity has grown over the last 100,000 years, punctuated with collapses and ecosystem decline. Human success clearly incurs ecological and social costs. Economist Kenneth Boulding called these ecological and cultural losses the “metabolic costs” of growth. Donella Meadows, and others simply pointed out the “Limits to Growth.” Since human impact now threatens global ecosystem balance, we don’t know if human complexity will continue to grow. Degrowth advocates suggest that the best strategy to ensure maximum human diversity is to stabilize our consumption and expansion. Dynamic homeostasis, nature’s genuine sustainability, makes demands on growing things, and simplicity proves as important as complexity. The notion of degrowth is not intended to destroy human society, but to preserve it. Yes, of course, but we need to understand nature’s costs and limits regarding recycling. Human economies should attempt to approach 100-percent recycling, but recycling itself requires energy and materials. In nature, recycling is a cost of life, not just a solutions. The laws of energy transformation teach us that there is no such thing as 100-percent recycling, even in nature, because of these throughput costs. In the autumn, when leaves fall and the air turns cold, it is not “pessimism” to point out that winter is coming. If hope is delusional, it is futile. The degrowth movement does not “attack” growth, which has its appropriate place in nature. The degrowth movement simply exposes the pretence of celebrating the benefits of economic growth while ignoring the costs. Rich nations typically ignore the costs of growth by exporting those costs to poor nations and to nature: Sending city garbage to the country, dumping toxic waste at sea, exploiting workers to make products cheap, and devastating the landscape in resource mining. A large portion of China’s CO2 emissions, for example, are really European and American CO2 emissions, because those nations consume the products of that pollution. Naturally, people resist the idea of limits on their consumption. The instincts to grow were forged in natural evolution, but those instincts don’t make limits disappear. Even in non-human nature, instincts can become counter-productive. Aggression, for example, exists because it had survival value, but in certain contexts aggression becomes destructive. When the context changes, instincts can be harmful. Once a species reaches its habitat limits, the instincts to grow and expand become a liability. Aren’t ecosystems destroyed just as thoroughly in poor nations as wealthy ones. Yes, but usually because those nations are plundered and exploited by the rich. Sheer numbers of inhabitants anywhere can deplete an environment, but wealthy-nation industrial expansion is the leading cause of global ecological destruction. Many cultures were sustainable for thousands of years, and could have endured many thousands more, until colonized by industrial nations, which took their resources, took slaves, waged war, practiced genocide, and so forth. In the industrial era, rich nations export destructive resource extraction, waste disposal, and social costs to the poor nations. Africa is not ecologically depleted and poor because Africans consumed too much stuff; it is depleted and poor because Europe and North America plundered it to fuel their economic growth. Now, China, Japan, and other industrialized nations have joined the plunder of poor nations and the global commons. Nature limits population growth, but for humanity, wealthy consumption and economic growth remain the primary causes of ecological destruction. But degrowth is not just a rallying cry or a trivial idea. Degrowth is an important, natural concept that our society needs to understand, whether we call it Degrowth, Limits to Growth, Costs of Complexity, Overshoot, Carrying Capacity, Metabolic Costs, Diminishing Returns on Innovation, Entropic Limits, “The Meek Shall inherit the Earth,” or “Richer lives, simpler means” as Arne Naess said. The problem for our society is not that these ideas are too complex or wrong, but that they are annoying and inconvenient for the wealthy and powerful. Everyone wants more. Millionaires want to be a billionaires. The more that individuals grab and horde, the less there is for everyone. On the other hand, as we learn to share and live modestly, our ecosystems can recover and provide us with nature’s bounty. 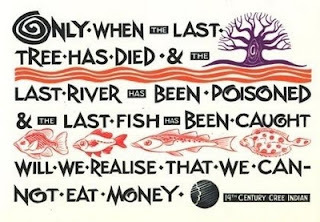 The best way for poor nations to avoid deeper poverty is to protect their ecosystems from plunder. The Degrowth movement advocates richer, more rewarding lives with less material stuff. Our economic efforts should focus on providing basic needs to everyone in the human family, rather than enriching a few, while others starve. Beyond basic necessities, happiness does not come from consuming more stuff. Happiness comes from friends, family, community, creativity, leisure, love, companionship, and time spent in nature. These things can grow without much material throughput. These are the qualities of life we should be helping to grow. This may be the most important public dialogue of this century. And we better get this right, because humanity may not get many more chances. Rex Weyler was a director of the original Greenpeace Foundation, the editor of the organisation's first newsletter, and a co-founder of Greenpeace International in 1979. He was a photographer and reporter on the early Greenpeace whale and seal campaigns, and has written one of the best and most comprehensive histories of the organisation, Greenpeace (Raincoast, 2004). His book, Blood of the Land, a history of the American Indian Movement, was nominated for a Pulitzer Prize. Deep Green is Rex's monthly column, reflecting on the roots of activism, environmentalism, and Greenpeace's past, present, and future. The opinions here are his own. T. Gutowski, et. al. (“Thermodynamic Analysis of Resources Used in Manufacturing Processes,”(PDF) Environ. Sci. Technol. 43(5) pp1584-1590, 2009).